The cryptocurrency exchange major Huobi reported that it had seen 100% growth in its trade volumes from 2017 to 2018. The Singapore-based exchange has also expanded its staff in the last one year. In 2018, the company employed 400 people, however, by early 2019, that number rose to 1,300 people spread across 15 offices in 12 different countries. According to reports, Huobi’s OTC (Over-the-Counter) trading desks has become one of the biggest OTC platforms globally. Cameron and Tyler Winklevoss, the twin brothers who are investors and who run the cryptocurrency exchange Gemini, have been ordered to pay entrepreneur Charlie Shrem back for the legal fees he incurred as part of an ongoing lawsuit. The Winklevoss twins have been ordered to pay back $45,000. The order, given by Judge Jed S. Rakoff, was filed in the American District Court of New York on Thursday. Judge Rakoff ruled that Shrem should be paid back the amount for a previous court ruling that allowed the Winklevoss twins to seize as much as $30 million of Shrem’s assets. According to data given by transactionfee.info, Bitcoin’s daily transaction volumes have been recently increasing to levels last seen in January of 2018. Some industry pundits and analysts are looking at the increasing transaction volumes as a indication of the crypto’s evolution of its ecosystem as well as fundamentals. Bitcoin personal key security company Casa’s chief technology officer, Jameson Lopp analyzed the performance of Bitcoin and concluded that the cryptocurrency’s system was growing and improving. Lopp stated that a number of upgrades to nodes have taken place in the last couple of years and these are finally beginning to have an impact. He said that these upgrades have improved efficiency in the Blockchain. 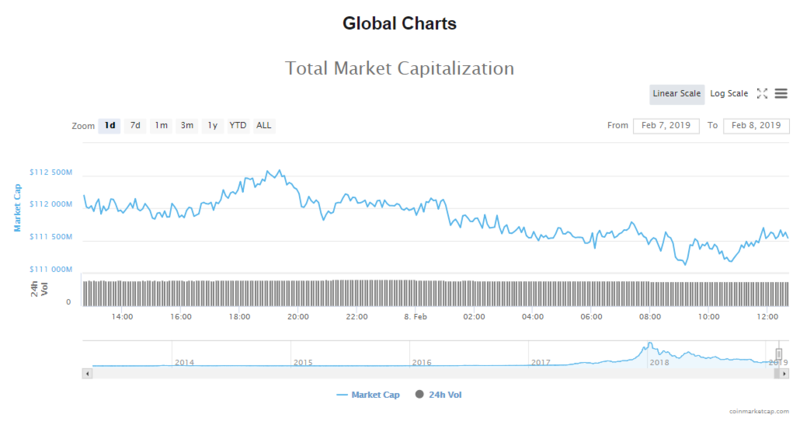 The capitalization of the cryptocurrency market has remained relatively stable for the third day in a row at $111.50 billion. Trade volumes are at $14.96 billion at the moment. Bitcoin’s price continues its downward slide for the third day in a row, losing 0.51% to trade at $3401.62. Capitalization of the most valuable crypto is now $59.61 billion and trade volumes are $4.97 billion. 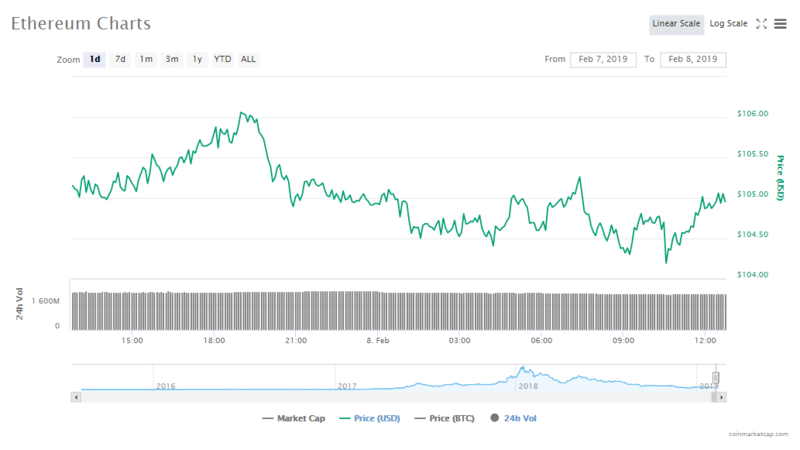 Ether’s price slipped slightly by 0.32% after one day of marginal gains. The altcoin is current trading at a price of $104.91 and is valued at $10.99 billion. Trade volumes are right now at $2.28 billion. The cryptocurrency market’s top ten digital assets are trading very marginally up or down. The only exception is Binance Coin, which has dropped by 4.58% in the last 24 hours. Tether is up by 0.02%, Stellar has gained 0.05% and Litecoin has gone up by 0.42%. Bitcoin’s token price is $3401.62, slipping 0.51%. Bitcoin’s value in the market at the moment is $59.61 billion. Ripple’s token price is $0.291299, slipping 0.51%. Ripple value in the market at the moment is $11.99 billion. Ethereum’s token price is $104.91, slipping 0.32%. Ethereum’s value in the market at the moment is $10.99 billion. EOS’s token price is $2.35, slipping 0.71%. EOS’ value in the market at the moment is $2.12 billion. Bitcoin Cash’s token price is $115.80, slipping 0.98%. Bitcoin Cash’s value in the market at the moment is $2.03 billion. Tether’s token price is $1.00, rising 0.02%. Tether’s value in the market at the moment is $2.02 billion. Litecoin’s token price is $33.43, rising 0.42%. Litecoin’s value in the market at the moment is $2.01 billion. 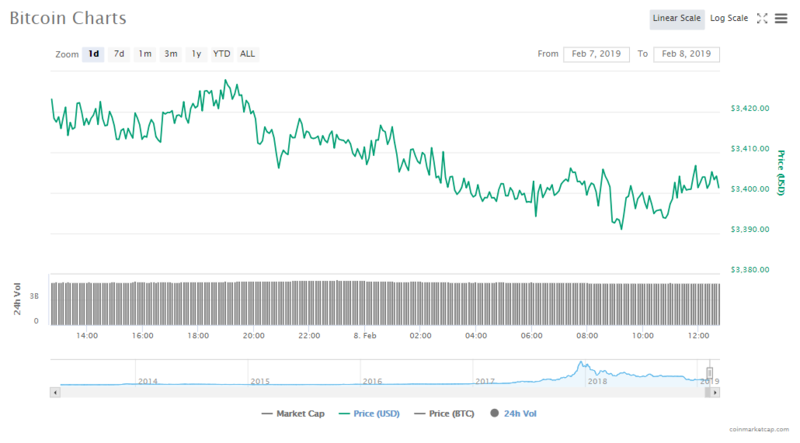 TRON’s token price is $0.025661, slipping 1.07%. Tron’s value in the market at the moment is $1.71 billion. Stellar’s token price is $0.074304, rising 0.05%. Stellar’s value in the market at the moment is $1.42 billion. Binance Coin’s token price is $7.94, falling 4.58%. Binance Coin’s value in the market at the moment is $1.12 billion. Tim Draper is a well-known venture capital investor. Now, he has predicted that total cryptocurrency market capitalization would likely to hit $80 trillion in the next 15 years. He made the prediction during the DealStreetAsia PE-VC Summit 2018, which was held at Singapore. The Bank of England has released staff working papers outlining multiple scenarios related to risks as well as stability issues with regard to Central Bank Digital Currencies (CBDCs). The papers have constructed three different models of how CBDCs could be utilized and what impact they would have. Venezuela’s Asamblea Nacional, a political group that is against President Maduro and his policies, harshly denounced the issuance of a petro cryptocurrency. The declared that they believed this move to be unconstitutional and called it a fraud as well as a threat to potential investors.